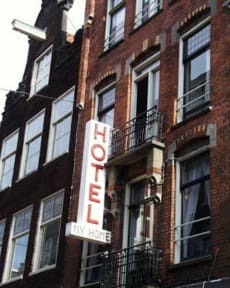 Hotel My Home i Amsterdam, Nederland: Bestill nå! Any cancellations need to be made a minimum of two weeks in advance. If there are any changes to the number of persons in the group, we also require two weeks notice. If these criteria are not met, the full amount of the stay will be charged to the guests credit card. Welcome to Hotel My Home, a small family run budget hotel in the heart of Amsterdam. Voted number 1 best shopping street in Holland and second best in 2011. We have been catering to guests from around the globe for 50+ years. Centrally located on one of the most diverse shopping streets on the edge of the colourful Jordaan we are within walking distance from Central Station (7mins) and many other sights not to be missed when visiting the city. Our street has every amenity you could need (supermarkets, laundry, cafes, pharmacy, CoffeeShops, restaurants etc) and our friendly, multilingual staff will be happy to provide you with free maps and tourist information. The reception doubles as a comfortable sitting lounge, with a television & stereo, social games, a soft drink vending machine & a free pool table for our guests. WIFI is available (free of charge) throughout the hotel. Please note, that although Amsterdam has added new tobacco laws, we are still 'smoker-friendly' for guests that choose to smoke in their rooms or in the outdoor patio area in the lounge. The rooms are simple and cozy, bedding and towels are provided. Each room has its own sink with hot and cold water, while the showers and toilets are shared with other rooms on the same floor. We include a great cooked breakfast (fried or scrambled eggs, cheese, jam, toast & all the coffee and tea you would like!) from 8:30am-10am. For late risers, free coffee is available all morning. While we have no age restriction, we do not allow you to bring your pets to stay with us, no matter how small or cute :).But however we do have two cats in the hotel called Tarzan and Jane. Our reception is open from 8:30am-23:00pm for check-in, reservations and inquiries. If you will be checking in after 23:00, please be sure that you indicate your correct arrival time, or if you will be delayed, that you contact us by telephone to let us know. Once you have checked in, you will have keys for 24 hour access, there are no curfews or lockouts. I loved staying in this place. 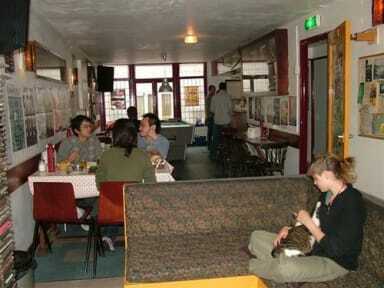 The staff was really friendly, made eggs of your choice every morning, and was very helpful. The hostel has all types of smoking tools available as well, so don't worry about bringing your own stuff. The rooms were nice and clean, but the one thing I really missed was some kind of locker to store my valuables. All in all it was a great hostel to stay in. I recommend trying it.